The normalisation of quantitative assay data is critical when interpreting effective biological system status. With cells grown in culture and lysed, a simple total protein determination such as the Bradford assay (developed by Marion Bradford at the University of Georgia in 1976) can be enough by giving an estimate of the total cellular proteins. 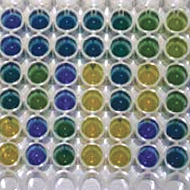 However, this type of measurement, along with Lowry and other dye binding assays, can be prone to errors due to various factors such as detergent, chelators… Standardization also involves the use of a protein of interest. Here again, the protein used is crucial for the accuracy of the overall assay. All the above indicated factors might compromise a whole study for Biomarker profiling. In this domain, all quantifications are normalised against total protein concentration to see changes in the status of each patient / patient group. Here are a few tips as far as standardization / normalization of data are concerned in biomarker discovery! The market provides several kits to perform this basic, but crucial step, in a simple and effective manner. These kits are intended for measuring protein, and use a BSA protein standard that gives the same result for both BSA and IgG. As research focuses on more personalized medicine, the analysis of urine, saliva, sweat, serum, plasma and tissues allows diagnosis and treatments to be developed. The normalisation of analyte results using an independent biomarker allows such results to be compared across researchers and samples. There are two methods of normalising urinary analytes. 24-hour urines involve measurement of the total volume of the urine excreted during a full day. Although this method allows total urine output to be accurately measured, it can be problematic. Humans dislike collection and storage of the 24-hour sample, and some analytes may have limited stability in the collected urine volume. The alternative is to collect a single random urine sample and measure urinary creatinine. Creatinine is a metabolite of phosphocreatine, a molecule used as a store for high-energy phosphate that can be utilized by tissues for the production of ATP. Creatine and phosphocreatine are converted non-enzymatically to the metabolite creatinine, which diffuses into the blood and is excreted by the kidneys. Under normal conditions, its excretion occurs at a rate that is constant and dependent on urine volume, making creatinine a useful tool for normalising the levels of other molecules found in urine. Kits in the market allow a rapid, easy to use and precise measurement against a US National Institute of Standards and Technology-calibrated creatinine standard. In a similar manner, for normalisation of assays carried out on red blood cells (RBCs), serum and plasma samples, hemoglobin is often used as a reference molecule. A number of enzymes or other molecules assessed in RBCs are reported per gm of hemoglobin, such as monitoring dietary therapy of patients with galactosemia due to galactose-1 phosphate uridyltransferase deficiency or uridine diphosphate galactose-4-epimerase deficiency. A Hemoglobin kit is calibrated to a native human hemoglobin standard and is designed to measure hemoglobin levels in whole blood, serum, plasma, and RBCs. All reagents are stable at 4° C and results are obtained in 20 minutes. The normalization of your measured parameter is an important decision. Choose your method and assay wisely!